Ahead of the upcoming concert that will see the likes of Akon, Wizkid, Sarkodie and more in Ghana, controversy sparks! In a recent video shoot for an up and coming Akon and Wizkid video, some Ghanaian models and girls were called upon to participate by the directors a few days ahead of the shoot. Presumably prior to Akon and Wizkid’s arrival in Ghana. A model reported on the day of the shoot some girls were turned away as the agent (or the man responsible for calling them) informed them that “they now want half cast girls”. A term used to describe girls with mixed heritage, usually ones with white blood in them. “THEY”, most likely referring to Wizkid, Akon and/or his music video producer, turning away a fleet of arrivals originally requested to attend by the model scout. In fact, the agent requested if the girls could help him seek light skinned girls because ‘THEY’ were so adamant on this request even on late notice. Nigeria, where WizKid is from, and Senegal where Akon is from, are countries both flooded with girls bleaching their skin simply because of such discrimination and being made to feel ugly if dark. Not just in media and modelling, but general favours in life. Whilst there are good people in both countries trying to reverse the self esteem damage of such activities such as Adama Paris who banned skinned bleach models from the Senegalese national fashion week, Akon and Wizkid’s team are trying to further such acts internationally. If this is the intentions Akon and the arrogant side kick Wizkid wish to introduce to Ghana, then we will be more than glad to uninvite them. Unfortunately for these bigots, Ghana has never been a land where girls are discriminated for skin tone in any field. In such matters, it is obvious they will pass the blame onto an employee to maintain their reputation. But for any such behavior, both these artists should be boycotted until their position is clarified. It’s a shame that grown men who might be an inspiration to some still hover the Earth will a very small minded approach when it comes to reality. It might come across as simply music video request, but it’s a habit existing in our countries born out of colonial rule, that unfortunately is also birth of skin colour discrimination and self esteem damage. Thank God Sarkodie did not sign to Akon’s label Konvict. 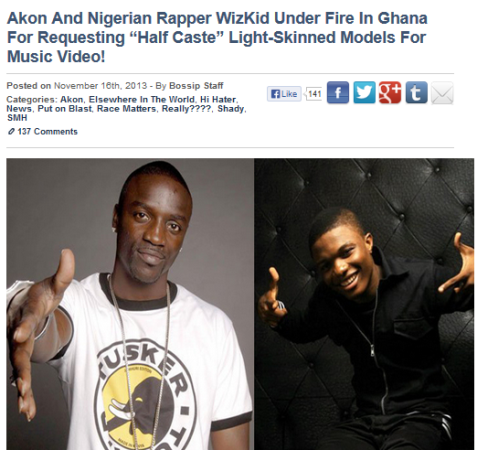 All I can say is I am looking forward to the departure of Akon and Wizkid from Ghana. That would be great news. In fact we would be very glad if any model continues to report any such activities going on in Africa (with remits) so we can name and shame the real perpetrators behind the skin bleaching epidemic. Whether this story is true or not, I’ve been asking myself the same question since. Why do BLACK NIGERIAN musicians go for lighter skinnedgirls/ girls almost looking white but there are so many beautiful dark skinned girls and I’m not talking bllllllllllllaaaaaaaacccccckkkkkkkkkkkkk and I’m pretty sure there are also beautiful blllllaaaaaaaacccccckkkkkkk skinned girls. I’m not Nigerian and don’t live there but my very close friends are and when I was in high school with them in Nigeria they were very beautiful and were blackkkk.